We’ve depicted the various settlements of mortgage liability, most importantly, the 2012 49 state/Federal deal called the National Mortgage Settlement, as a “get out of jail almost free” card for banks. It was tantamount to a second bailout for the widespread failure to securitize mortgages in accordance with the bank’s own requirements, and the resulting foreclosure abuses that resulted. The Wall Street Journal has endeavored to find out where the money, which nominally totals $110 billion across the six biggest banks, went. While the story does not say so crisply, perilously little benefitted borrowers despite concerted efforts to pretend otherwise. The reason that the Journal fails to discern this fact it that it perpetuates one of the myth of these deals, which yours truly, Dave Dayen, and others who have written regularly on this topic, have debunked: that the “consumer relief” portion of these deals represented a meaningful cost to the perps, and was beneficial to homeowners. But those were not hard dollar payments, but mere credits for the banks doing things they would have done anyhow, such as bulldozing vacant homes, or making modification where it suited them (too often of securitized first mortgages which enhanced the value of second mortgages they owned). Mind you, mortgage investors were up in arms about the fact that the National Mortgage Settlement gave credits for modifying mortgages that banks did not own. As we and others have written at considerable length, the mortgage settlement was a big exercise in optics. The $26.1 billion number sounds impressive until you compare it to the size of the housing market and the damage done to homeowners. 40% of the value of the settlement can come from junk credits, things the banks would have done anyhow or should be doing in the normal course of business, like razing vacant homes, short sales, and giving homes to charities. And of the remaining part, which was a relatively small amount of actual cash payment ($5.8 billion, but that included over a billion of fines federal regulators rolled into that total), the rest is supposed to be reduction of mortgage principal. Oh, but wait, they can take credit for modifying OTHER PEOPLE’S MORTGAGES, meaning those owned by investors. And they’ve been doing that in more than half the cases…. Today, the settlement monitor Joseph Smith released another PR piece, um, progress report. These reports are already sus since the monitor isn’t require to say anything about his work until first quarter 2013. So this looks like an exercise in messaging over moving the ball forward (reports like this take a lot of work and divert resources from oversight). We weren’t alone in criticizing the prevalence of short sales, which results in borrowers losing their homes, over various forms of relief, most important, deep principal mods, which keep them in place. Even with the housing market bounce, losses on foreclosures are so high (70%+ of mortgage value) that a deep mod (30% to 50%) is a win-win if the borrower has an adequate level of income. So this sorry settlement is playing out as predicted: relief for only a small number of borrowers, and then mainly better off ones, with the banks getting a huge “get out of liability” card on the cheap. And to add insult to injury, we have to read colored pie charts doctored to make a bad story look a smidge less awful. 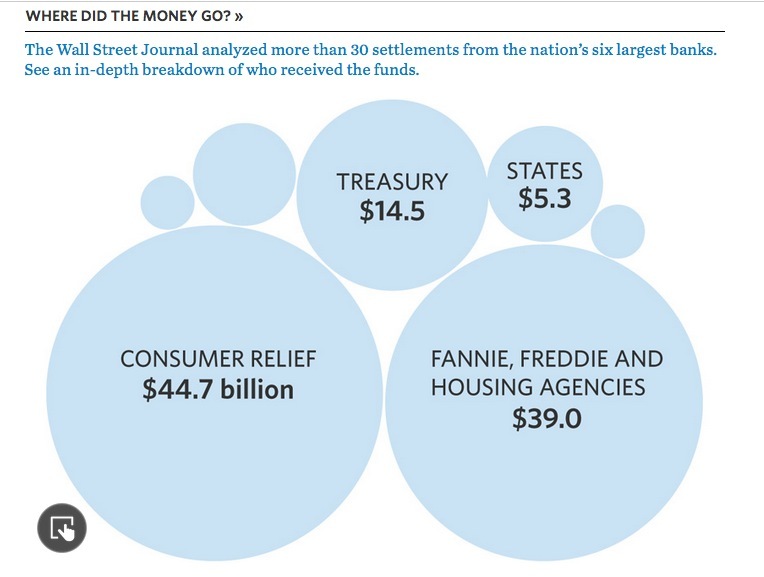 Of $109.96 billion of federal fines related to the housing crisis since 2010, roughly $50 billion ended up with the U.S. government with little disclosure of what happened next, according to a Wall Street Journal analysis…. • The Treasury Department received almost $49 billion of the funds, including money the agency received directly and sums funneled to it by other departments, including government-chartered housing associations Fannie Mae and Freddie Mac. How the money is spent isn’t specified…. • The Justice Department, whose prosecutors led many of the negotiations with banks, collected at least $447 million. How it spends the money isn’t specified. Mind you, I am not saying these other uses of funds at the state level were not worthwhile. But the main objective should have been to make sure that the parties that suffered the most were the main beneficiaries. And have no doubt about it: they weren’t. Not only did the banks provide “consumer relief” only that was cheap and convenient to them, they were also not required to fix their servicing procedures and platforms, which virtually assures that borrowers that fall into arrears are likely to be mistreated. And the officialdom is in denial not just regarding the human costs, but the political one, that of deligitimating authority. Because Obama was so deeply wedded to his neoliberal agenda, he didn’t appear at all chastened by the losses the Democratic Party took in Congress during his Presidency. And he ignored the key portent of losing the 60 seat majority in the Senate when Scott Brown won in Massachusetts. Political scientist Tom Ferguson found that there was a strong correlation between foreclosure rates and the proportion of votes in a district cast for Brown. Similarly, the continuing calls for prosecution of bank executives are a refection of the widespread recognition that the financial services industry nearly took down the entire economy, got a massive taxpayer bailout while Main Street was left to take its lumps, and not only did no one go to jail, hardly anyone even took any career hits. If the officialdom is mystified as to the rise of Sanders and Trump, they need to look at the handling of the mortgage crisis as one of many examples where the elites were favored over the general public, and contrary to their pet beliefs, the public is not so clueless as to be fooled about who were the winners and losers. This entry was posted in Banana republic, Legal, Politics, Regulations and regulators on March 10, 2016 by Yves Smith. How do you explain the Nevada primary results? What odds do you give Sanders in FLA? Following the “debate” last night in Florida, which to me appeared slanted & biased by the moderators regarding division of time between HRC & Bernie Sanders, they made it harder for him to win there. At one point Bernie was obviously flustered, demanding equal time to respond. I don’t think he ever got that. When Wall St was just touched upon & the moderators then insisted on changing the subject, the audience booed loudly, as did I. The moderators changed the subject, anyway. I’m hoping he pulls out a win there, despite their best efforts to muzzle him. News reports showing Bernie Sanders “lost” the Iowa and Nevada Caucuses were without context. He was behind in the polls just days before both elections. Remember seeing headlines “ Sanders trails Clinton by X points?” Then the results come in and Bernie lost by X +15 or X +20. So the polls were wrong and the Bernie Bandwagon is gathering steam. It will soon roll over Trump 60% to 35%. People are upset about the financialization of everything including polling and voting. The only “relief” I got was from this site, about the only place to find a reflection of my own reality. There are real victims, and the problem is not solved through “optics” or better “messaging”. Well said. I, too, turn to this site to confirm I’m not alone as a victim & sites such as this are exposing the truth behind the lies. I’m now so sick of the word “settlement” it unsettles my stomach! Just over a week ago in the same county in CO where my home of 20 yrs was stolen by Chase Bank, 3 Sheriff’s deputies were shot during an eviction. One deputy died, as well as the homeowner. Another deputy seriously wounded but recovering. Another suffered minor injury. While I in no way justify the homeowners actions in taking lives, most want all the blame to fall on the “crazy” homeowner, where I feel some blame should fall on the bank & the govt, as well. If the banks were not allowed to continue their massive fraud throughout our nation while the govt observed it for years saying, “Fraud? What fraud?”, incidents such as that would never happen. The blood should be on their hands, as well. I moved to the county of your 20 year residence after having my own farcical experience with the mortgage fraudsters. I’m renting here now–a 2 hour drive to and from work. I’m sorry you were a victim of this theft, as were too many of us. I didn’t personally know the men who died or were injured in the shooting incident. The evictee was an Occupy activist who had waged a multi-year battle with his bank over the foreclosure. In the months leading up to this, he’d reported intimidation and even having his teeth knocked out by local law enforcement. Affordable housing activists had called for peaceful resistance at his property. The violence that ensued helped neither his nor any other homeowners’ predicament when it comes to the great housing crisis of our time. Here’s to hoping homo sapiens gets it together, and fast. What started as fraud and continues as price gauging will soon be recognized as a drastic loss of human habitat. Not only did I not receive a settlement, I’m still paying for a home I haven’t owned for 6 years! (Mortgage insurance CONpany held my bank approved short sale hostage until foreclosure started. They demanded a $10000.00 promissory note to close). Can you give more details about the Jones case? The case name, case number, Federal or State Court, case citation, facts, and what the Court said in its decision? Thank you very much. And then there’s homeowners like Bruce Morgan, of Wenatchee, who when becoming evicted took a shot through his front door attempting to kill the evictors and then shot himself. The President, Congress, State Legislatures, Governors, City Councils, all sitting judges. My response: VOTE OUT EACH AND EVERY INCUMBENT BY REACHING ACROSS PARTY LINES. Unfortunately facts never hit the big time in terms of this issue. I still hear lots and lots of people I know (it’s anecdotal, but nearly everyone I know sings the same chorus, no matter how they vote) blaming the homeowners. They shouldn’t have taken out the mortgages that they couldn’t pay blah blah blah. It’s all their fault because they were irresponsible blah blah blah. We’ve had a couple of movies out of Hollywood that more or less correctly depict what happened, but even that doesn’t penetrate. When I’ve pointed out this blog and others where people who owned their homes for decades got screwed, I’m resoundingly told that “those people” were most likely living too high on the hog and they had it coming! It’s seriously sad when citizens have been so brainwashed to kiss up and kick down, but that’s what I see over and over. Again, I am glad that Sanders is running. Whether he ultimately makes it to the GE or not, I want him to keep running and keep getting the message out. I know that this particular issue is not what he focuses on exclusively, but at least Sanders is pointing out how much our system has been gamed and rigged by the Oligarchs. I can only hope that his message gets through. I listened to Sanders’ speech in FL a few days ago. It was well crafted and hits all the issues that require attention. I was skeptical of him being a “sheepdog” at first but the more I see how tirelessly he campaigns and shows that he’s principled, the more I like him. Go Bernie! I’m now involved in a class action suit against Chase Bank. It involves the bank continuing to access our credit long after they had any right to, such as after taking our homes or us declaring bankruptcy, or both. As one of the victims (they kept the home in my name in their files for over 3 yrs after taking it–after it sold twice, & put forced place insurance on it–twice–during that time—under my name), how much will I get? Yes. $50. Out of $8.75 MILLION. And to get that I must give up any rights to sue ’em in the future, while they, of course, admit to no wrongdoing. The lawyers who filed the suit on behalf of a victim will get one third. The victim who filed the suit will get no more than $10,000. That still leaves millions, right? Well, out of the rest of that “settlement” money comes all the cost of notifying us victims they screwed us. The money it costs the bank to set up a website, 800#, mailings, etc, all comes out of OUR money. The “settlement” money! WE VICTIMS are paying for the bank to notify us they screwed us. Plain & simple. If there’s any money left over due to being unable to reach some victims (since they’d kicked us outta our homes), they can donate it to a charity of their chosing. If I’m correct, the bank gets a tax write-off for the chunk they must spend to notify us, despite the fact it’s actually “our” money they’re spending. Any money left over they donate to charity is another write-off. I see it as helping the bank, more than hurting it. With all their illegal profits, they need the tax write-offs, no doubt. When I called one of the attys on this case & inquired if I was understanding this settlement correctly, in that we victims were paying for the notifications, he said it was the “best they could do” & I should be happy, ‘cuz “It’s the largest settlement of it’s kind”. Should I mention that the attys get their third regardless of who pays for the notifications? Us victims are getting screwed once again. Same ol’, same ol’. In my almost 65 years I’ve never been so disgusted with a govt that is supposed to represent us. (I’ve refused to call it “my” govt for some years now). Hell yes, it’s time for a political revolution in this country! Enough is enough, dammit! Almost all class action suits pay a pittance to the claimants and a bundle to the litigating lawyers. The bailout of the banksters was just the beginning of a wave of bankster friendly policies and legal assertions (too complicated to prosecute, above the law, etc) that has continued their ever growing bailouts to this day. Did they pay us back for the bailout and the ensuing legislations that welcomes their fraud with open arms and is dividing this country along the lines of government chosen winners and losers, when that equates directly with our growing inequality and lower wages? Hell no, not even close. The bailout was obviously just the beginning. Much like bankster counterfeiting was made legal with the institution of the Federal Reserve and fractional reserve banking over 100 years ago, the recent frauds of the banksters has been made legal and that tears even more at our Constitutional basis as a country. No, the bailout was never paid back and where this corporate welfare will end we suspect, but we don’t know. Bernie gets it and I don’t think HRC can or ever will grasp this. Oh, Hillary “gets it,” but she is paid very well to divert attention. Wall street spread an infection and blamed it on the sheep. Government dug a ditch and shot all the sheeple. What can be said that hasn’t been said before. All the help for the borrowers were lies. I witnessed and lived it through every department in this country. It maybe insignificant but Joseph Smith did respond to my letter when reporting a lender using tricks to slip through the cracks. He said he had no authority but would forward to the right department. To me, that was a small token compared to every other department sending RE: RE: RE: letters to get out out of doing their job. Bloomberg has already called it. Sanders will not even take FLA; the state that did the most runway-foaming of them all, and is bleeding still. No, the people do not get it. Then, for me, it will be write in Sanders vote. • Over $5 billion to the states to help with *their* budget tallies, leaving less than $10 billion for the millions of harmed parties. And note that is an upper limit on said relief, since other diversions and dilutions are highly likely. Yves, is that tally-of-the-leftovers right? @CRITTERMOM, Chase laughs at these class actions. I was in one where they breached 1000s of loan mods. Lawyers walked with 9 million, the group that initiated the class action got 3k. I am still waiting for my benefit which was supposed to be a loan modification that in the summary of the class action claimed to be “Substantial”. This is coming up on 2 years now. You have to file your own case against them. @Yves: Thanks for adding the part I overlooked … so we are left with basically 0 going to the harmed parties. That sounds about right. Government simply turned the whole debacle into a huge stealing-from-the-original-thieves enterprise. That sentence from 2012 ultimately put me into foreclosure and bankruptcy. (The idiot who wrote it was Judy Anderson, and I would love to meet her some day.) The servicing of my loan was sold to RCS while I sought new leases, and RCS cannot read instructions. See my next comment for more on RCS. Recall Mr Dayen’s story on Residential Credit Solutions and the fabricated documents? RCS was just sold by American Capital Mortgage Investment Corp after losing money every quarter since they were acquired in 2013. Their infamy began when Geithner let them buy the assets of a dead bank: bad loans with a $1.3B face value, for five cents on the dollar. It was complicated but I think FDIC lent them the $65M, too. That was the kickoff for PPIP in 2009. Bloggers including baseline scenario and other money people were shocked. There was a quieter deal a year later when they bought AMTrust’s assets in partnership with FDIC. They agreed to work with borrowers on modifications, but went to work turning the paper into REOs. One case arising from that was so egregious that the homeowner was awarded $2,000,0000 in punitive damages. In 2015 CFPB slapped RCS but it barely stung. RCS improperly denied my HAMP application and those of countless others even after that, because they do not understand the HAMP instructions. I found out after my complaint to CFPB, courtesy of RCS. RCS’s response included their description of the steps they took to deny my application. THEY WERE DOING IT WRONG. I had to file for bankruptcy and since then have written to them three times. I finally got a response just after American Capital Mortgage Investment Corp sold RCS to ditech. It took a second CFPB complaint. RCS’s response was 65 pages, including a letter that described everything that happened with my applications, but did not go near my complaint. Did not even acknowledge it. and that they did not extend my loan term as a means of reaching the HAMP-mandated payment amount. They offer HAMP mods to just 12% of applicants. Theirs is the lowest HAMP success among the servicers who rates the Treasury posts every month. The second to lowest servicer accepts 1.4 times as many. The US Treasury knows that and has done nothing? If this could get more airplay I do believe a law firm would have a field day with it. A lot of people lost their homes right under the Treasury’s nose.